Author and Detroit native Kevin Boyle is pretty pumped about the idea of coming home. The reason? 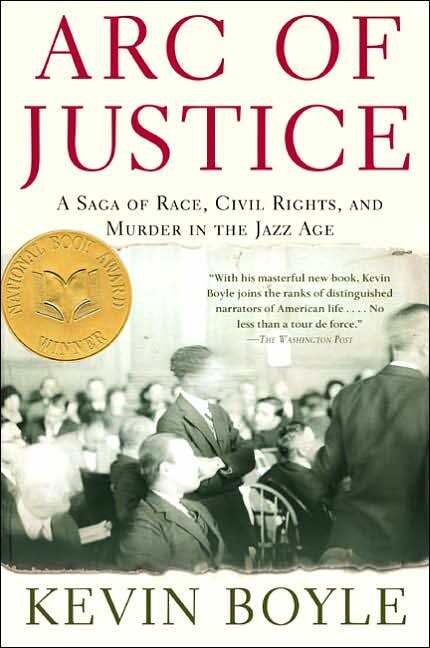 Boyle’s compelling book, Arc of Justice: A Saga of Race, Civil Rights and Murder in the Jazz Age is the Michigan Humanities Council featured title for the 2011-2012 Great Michigan Read. Boyle’s Arc of Justice “tells the story of African American Dr. Ossian Sweet and the chain of events that occurred after he purchased a home for his family in an all-white Detroit neighborhood in 1925.”* After an altercation one evening with his enraged white neighbors, Sweet’s life – and the course of Detroit’s racial history – are forever altered. Published in 2004 (Henry Holt and Co.), Boyle’s Arc of Justice was released to high praise. Called “electrifying” and “powerful” by critics, Arc of Justice snagged several coveted literary prizes such as the 2004 National Book Award for Nonfiction and the Chicago Tribune Heartland Prize, and was nominated as a finalist for both the Pulitzer Prize and the National Book Critics Circle Award. Arc of Justice has also made its mark on Michigan’s literary scene. Boyle’s nonfiction book was selected in 2005 as a Michigan Notable Book and was the 2007 pick for the Detroit metro community-wide Everyone’s Reading program. Now Arc of Justice returns for another appearance in the state as the star of this year’s Great Michigan Read. The Great Michigan Read is a free statewide initiative intended to encourage Michiganians of all ages to read and participate in book discussions and events that take place across the state. It targets Michigan themes so the literature will be more accessible and interesting to citizens of communities throughout the state. Free is certainly a word that catches the eye these days. As our literary and educational resources continue to dwindle, programs such as the Great Michigan Read are a boon to local communities and to those of us who relish fine reading. Book clubs, classrooms, colleges and museums are but a few of the potential sites that can sponsor a reading or get directly involved with Arc of Justice and bring fine literature to life. Kevin Boyle will be appearing in Detroit at the Charles H. Wright Museum of African American History on Thursday, October 27, 2011 at 7:00 pm. His discussion of Arc of Justice will take place at the General Motors Theater at 315 E. Warren Ave (www.thewright.org). If you aren’t in the metro area, feel free to link here for a full schedule of Great Michigan Read exhibits and events. It’s not surprising to find author and Detroit native Kevin Boyle handling reviews of the new Clarence Darrow biographies in this week’s New York Times Book Review. As a history professor and author of the nonfiction work Arc of Justice: A Saga of Race, Civil Rights, and Murder in the Jazz Age, Boyle has crossed literary paths with defender Clarence Darrow many times before, and has become a go-to for input surrounding American history’s best-known trial lawyer. The quick mention of Ossian Sweet is a testament to Boyle’s own humility. Sweet sits at the center of Boyle’s compelling book Arc of Justice, which has been selected by the Michigan Humanities Council as this year’s featured title for the 2011-2012 Great Michigan Read. Published in 2004, Boyle’s Arc of Justice was released to high praise. Called “electrifying” and “powerful” by critics, Arc of Justice snagged several coveted literary prizes such as the 2004 National Book Award for Nonfiction and the Chicago Tribune Heartland Prize, and was nominated as a finalist for both the Pulitzer Prize and the National Book Critics Circle Award. Arc of Justice tells the story of Ossian Sweet and the chain of events that occurred after the African-American physician purchased a home for his family in a completely white Detroit neighborhood in 1925. After Sweet has an altercation with his new, enraged neighbors, Clarence Darrow steps in to act as his defender in what would become the famous Sweet Trials. Ultimately, Sweet’s life and the course of Detroit’s racial history are forever altered. Knowledge is power, and it often rounds out the reading experience when you can bring a bit more with you to a title. If you’re planning on reading Boyle’s Arc of Justice, you might want to check out his take on authors Andrew E. Kersten and John A. Farrell’s new Darrow biographies. For a much briefer but thorough article on Clarence Darrow, try The New Yorker piece Objection, which quotes from Kersten’s new work.